Veiled Chameleons all have their own personalities. Some individual chameleons may become tame to the point of climbing over to "greet" you at their cage door, others will only want to come out occasionally. Letting your Chameleon come out for a wander (supervised) every now and again is a good idea and helps keep them fit. To tame your Chameleon, try and get him/her to hand feed from about 10 weeks old. Firstly, place a waxworm in the flat palm of your hand about 10 inches from your chameleon so as not to scare him/her. Then be patient! The waxworm will start to wiggle and eventually the chameleon will notice the food. Once your Chameleon is looking at the food with both eyes it should soon fire out its tongue to catch its prey. It might take a while at first but eventually the chameleon will become more confident and will eventually take food quickly every time. Once it is feeding confidently from your hand other foods can be introduced. Housing Chameleons can either be kept in purpose built Chameleon enclosures or normal vivariums (height needs to be about 20 inches plus for adults). If a normal vivarium is used, one of the glass doors should be replaced by a mesh panel as all Chameleons require a lot of ventilation (have the remaining glass door the same side as the basking lamp). Poor ventilation, like that found in a typical glass aquarium, will allow the air to become stagnant and provide an opportunity for fungus and bacteria to grow which in turn will effect the health of your chameleon (and may even kill it). The cage should be furnished with branches of different diameters so that the chameleon can easily navigate the entire cage. Live plants will provide good hiding places and add to the beauty and humidity of the enclosure. Because some chameleons are known for eating vegetable matter, only non-toxic plants should be planted in their enclosures. The most common choices among chameleon breeders are Pothos, hibiscus, Umbrella plants or Ficus benjamani, Ficus "Alii", and Ficus natidia. Plastic plants can also be used with or instead of real plants and have the advantage that they are easily cleaned. The arrangements of lights, plants and branches should be such to allow for at least one basking site where the temperature will reach the upper limits of the animal's comfortable temperature range. The temperature in the rest of the enclosure should be lower allowing the animal to thermoregulate (chose its own temperature) by moving around the cage.Do not use substrate with chameleons as it can sometimes get it stuck in their digestive track causing problems. Temperature Veiled chameleons, coming from Saudi Arabia and Yemen, need hot temperatures during the day. The basking area should be around 90ºF to 95ºF. At the opposite end to the basking spot the temperature should be at least 10ºF lower than the basking spot. With a mesh door it's relatively easy to achieve this. Standard 40 /60 watt light bulbs can be used to create a basking spot. Vary the wattage to get the basking spot the right temperature. Alternatively attach the bulb to a dimmer thermostat with the heat sensitive probe situated near the basking spot. As Chameleons climb on anything its better not to cover the heat source with a wire cage otherwise they tend to climb on the cage and burn their underside. Its better to situate the heat source far enough away from the nearest branch that they can't touch it at all. The basking spot light should be on for 12 hours a day. Baby Chameleons should be kept a bit cooler than adults during the day. Veiled chameleons are very hardy chameleons that can withstand a large range of temperatures. At night, it is necessary for them to experience at least a 10ºF to 15ºF drop in temperature. In a normal house, no heating is required at night. This allows better resting and simulates their natural habitat where temperatures drop significantly at night. Lighting Lighting is very important for Veileds as it is for all chameleons. Veileds should be provided with a UVA/UVB producing light source and a basking light. UVA and UVB exposure allows chameleons to synthesize vitamin D3 into their skin. The synthesis of vitamin D3 allows the absorption of calcium which is critical for all chameleons. No tungsten light produces UV light (even so called full spectrum or Reptile basking lights). They are perfect however for basking lamps. water Few chameleons will ever learn to drink water from a standing water dish. In the wild, chameleons lick dew and rain droplets off of leaves, or are attracted to moving water. This means that in captivity, special watering techniques need to be used to keep chameleons healthy and hydrated. Chameleons are naturally attracted to droplets of water which reflect light. Chameleon keepers can take advantage of this by designing water systems that takes this natural behaviour into account. Drip systems are the most common form of chameleon watering system. They generally consist of a container of a water container that sits above the enclosure. A plastic tube with a flow control clamp runs from the water container and into the chameleon cage. Water slowly drips out of the end of the plastic tube. Pre-made drip systems are available and generally include some sort of adjustment to control the rate at which water drips from the tube. Other, simpler drip systems can also be used. A tub of water with a hole in the bottom made by a drawing pin works just as well suspended from the ceiling of the enclosure. If a drip system is used in a chameleon cage, care needs to be taken to prevent the cage from becoming too wet. This is easily accomplished by placing a container inside the cage to catch the dripping water. Make sure the chameleon can't tip it over. Covering the container with mesh will prevent the chameleon or crickets from falling in. The water can then be emptied every day. Another method of watering your chameleon is to simply mist the inside of the enclosure several times a day. Chameleons will eagerly lick water off plants, as well as the sides of the enclosure. With Veiled Chameleons you should mist twice a day and have a drip system going for about 10 minutes at a time at least once a day. If no drip system is used increase the spraying to several times a day. After a while you may find the Chameleon will drink directly from drips from the water spray. Some Veileds rarely drink water however that does not mean it should not be available regularly. Chameleons like clean warm drinking water. Pre boiled semi-cooled water or mineral water (warmed up with boiling water) is best. If using tap water leave it to stand for a while to allow chlorine etc to disburse. Water temperature drops dramatically when sprayed. To get the right temperature, spray your hand from 12 inches away. If it feels warm then it's the right temperature (you will find you have to use fairly hot water in the spray bottle to get a warm spray at 12 inches). Be careful if your Chameleon drinks directly from the nozzle of the spray bottle as the water for spraying could be too hot if coming out in drops. Feeding Veiled chameleons will eat a bit of vegetable matter, along with their diet of live insects. You may find that the plants in the enclosure gradually get eaten by the Chameleon (although some never eat vegetation at all). Try watercress, grated carrot (or sweet potato) and chopped spring greens. Dandelion leaves are an excellent replacement for spring greens and watercress. Just make sure you pick them from areas that don't use pesticides and wash them first. All captive chameleons require calcium and vitamin supplementation. The specific reason for this is beyond the scope of this document. But in short, chameleons need vitamin D3 in order to metabolise calcium for growth and proper nerve functions. Many 'basking' reptiles naturally produce vitamin D3 in their skin when they bask in the sun and are exposed to UV radiation. Since the UV output of most human-made full-spectrum lights do not provide the same UV exposure as the sun, additional supplementation is ESSENTIAL. Feed your chameleon(s) daily by placing live insects with the fresh vegetables into a plastic container which is large enough to prevent the insects from escaping (a 2 litre ice cream tub is perfect). Vitamin &/or mineral supplementation when required can then be sprinkled on the insects and vegetables. Shake the container to evenly coat the vegetables and insects with the supplement. Alternatively use a plastic cup and suspend the container under the chameleons favourite perch. Do this in such a way that it is easy for the chameleon to reach the food in the bottom of the container. The insects will eat some of the vegetables so keeping them gut loaded and alive hence the chameleons will benefit even if they do not directly eat much of the vegetable matter themselves. For very young hatchlings, a baby food jar makes a nice food dish. The same vegetable mixture that is fed to your chameleons should also be fed to the insects you will feed to your chameleons. This will ensure the insects are healthy and nutritious by the time your chameleons eat them. 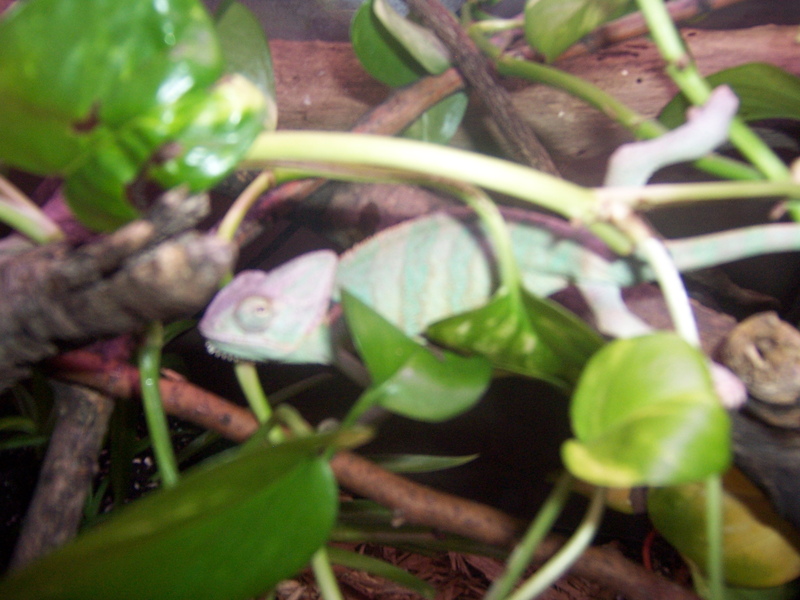 Following is a list of the different insects you can use to feed your chameleon. Veiled chameleons, when young, should be fed as much as they will eat. As they get older they should be given a more stationary diet (large crickets, large mealworms or superworms, waxworms, earthworms etc.). It is important that you limit the amount of food you feed an adult chameleon. Allowing a chameleon to gorge itself, will result in a very obese and unhealthy chameleon. When they are young they will devour anywhere from 6 to 20 small cricket sized insects daily. When they grow up to adults, they will eat about 5-15 full grown medium to large sized insects. Calcium Most feedings can include a light dusting of a pure calcium supplement such as Bone Aid Calcium powder although if all food is well gut loaded every other day is fine. Multivitamins Add a good dose of Nutrabol multivitamin and calcium powder 1-2 times per week. (twice a week for babies). Female Chameleons - Egg Laying As with all egg laying lizards, females can have a tendency if not looked after properly to retain eggs, which can eventually kill them. A common misconception with Chameleons is that if a female Chameleon is not mated she will die egg bound. This is not true. If however she is not given a suitable place to lay her eggs then this is possible. Female Chameleons will produce eggs 2-3 times a year whether they have been mated or not.